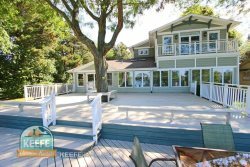 This gorgeous (5) bedroom and (4) bathroom home is located on Lake Geneva. With great views of the water and a quiet neighborhood, all you need for a relaxing summer stay is provided. Enjoy the large deck off of the front of the home to take in the summer sun! There is a private pier to dock your boat or other water crafts that you bring with for your stay, and there are also two association piers located within a 2 minute walk from the house! The large living room space and internet access will make family time easy! Plenty of seating is available for your dinner plans! Have your mail delivered daily via Gage Marine's historic Mail Boat!